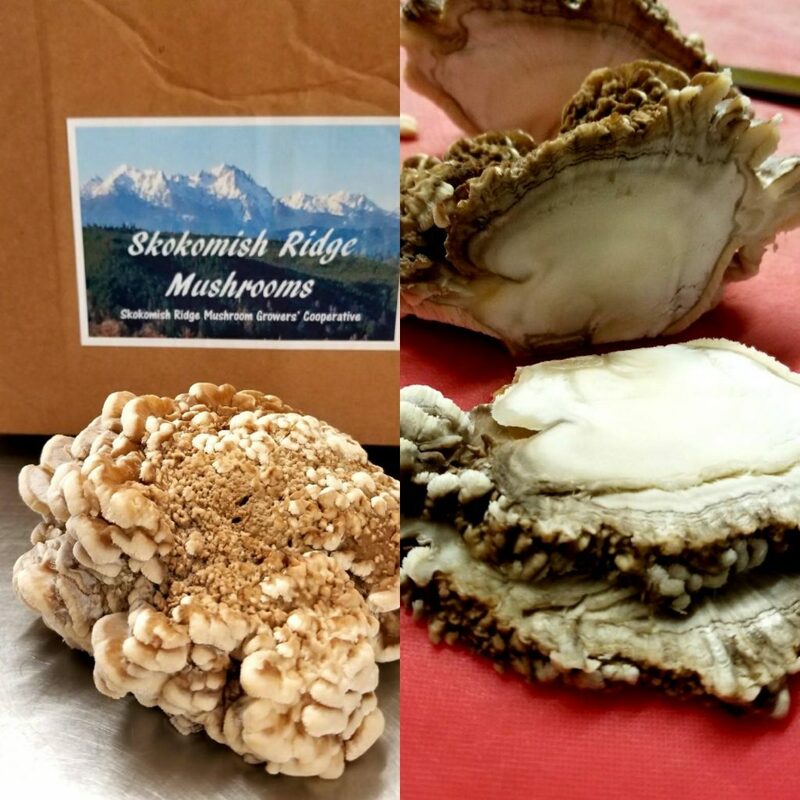 Can you guess what kind of mushroom this is from Skokomish Ridge Mushrooms? In Europe and the United States, this mushroom (Grifola frondosa) is commonly called Hen of the Woods, since its frond-like growths resemble the feathers of a fluffed chicken. Maitake is another name, in a bow to the Japanese who pioneered its cultivation. Maitake mushrooms are known in Japan as “the dancing mushroom.” According to a Japanese legend, a group of Buddhist nuns and woodcutters met on a mountain trail, where they discovered a fruiting of maitake mushrooms emerging from the forest floor. Rejoicing at their discovery of this delicious mushroom, they danced to celebrate. Maitake mushrooms – indigenous to temperate hardwood forests and are particularly fond of oaks, elms, and rarely maples — can also be cultivated outdoors as well as indoors. Two advantages of cultivated maitake are that they are cleaner — free of the forest debris that typically becomes embedded within the uplifting fronds of wild ones — and that they can be grown all year long. Maitake contains L-glutamate, a natural flavor-enhancer that provides umami — the “fifth taste” — the savory rich flavor that excites receptor-specific nodes on your tongue. We will be including maitake in tonight’s steak dinner special. That’s right, we said STEAK! Come enjoy a flat iron steak with chimichurri sauce over a bed of fresh arugula from our gardens served with roasted potatoes.